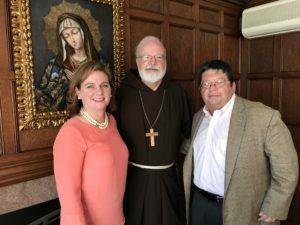 I want to begin this week expressing my concern, shared by my brother bishops, over the potential elimination of the program Deferred Action for Childhood Arrivals, commonly known as DACA. Under this program, which was instituted more than five years ago, young people who were brought to this country by their parents as undocumented immigrants were invited to come forward to apply for permission to remain in this country to study and work. It has been widely reported that the Administration is considering reversing this policy, and that that decision could come as early as this weekend. I want to add my voice to those urging that this just and humane program remain in place. While there is a great divergence of opinion on which direction U.S. immigration policy should ultimately take, all sides certainly agree on one point: that the current system is broken and needs to be fixed. DACA, though not the solution to this problem, was an important step in helping create stability for these young people and children who did not enter this country of their own volition, and many of whom have known no other home. Having ministered to immigrant communities throughout my life as a priest and a bishop, I know these young people are the very type of immigrant that the President recently said he wants to invite to this country — those who can hold a job, contribute to our society, obey our laws, and serve our country. The young men, young women and children currently protected by DACA are doing just that, striving to be productive members of our society, they only want the opportunity to continue to do so. For this reason, I want to join the U.S. Bishops in urging President Trump to keep this important policy in place. We are indeed a great nation and I know the contributions made by these young people protected by DACA will help keep it so in the future, so long as they are given the chance. I also want to express my concern and offer my prayers for the victims of Hurricane Harvey. In addition, I have authorized a special collection at all Masses next weekend, September 9-10, to aid in the relief efforts. Having experienced the devastation of Hurricane Hugo while I was the Bishop of the Virgin Islands – where we were left for six months without water, telephone or electricity and where the schools were closed for two years and so many people lost their homes and their jobs – I have seen up close the devastation that a hurricane can cause to communities and to individuals. 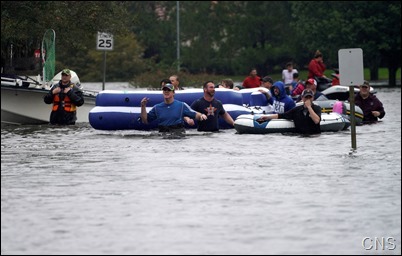 I know that the Catholics of Boston will be very generous in their response to help our neighbors in Texas who have been so devastated by this hurricane, the terrible storms and flooding. This past weekend I was visited by my old friends Martim and Carolina Lobão. 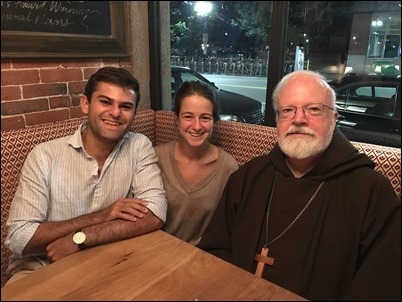 They have moved to Boston and will be studying here for two years. His family was part of my Portuguese Parish in Washington, D.C. for many years, and I baptized Martim and his seven brothers and sisters. So, I was very happy to see them and welcome them to Boston. Also this week I met with Marjorie Dannenfelser, the director of the Susan B. Anthony List, and Frank Cannon, president of the American Principles Project who is a senior consultant for the Susan B. Anthony List. Susan B. Anthony List is an organization that is working to advance the pro-life cause. They are reaching out to legislators of both parties to try to bring about legislation that will protect human life, and they came to talk to me about some of their activities. This weekend is, of course, Labor Day weekend. As we all know, with the passing of Labor Day comes the start of classes for all types of students — including seminarians. 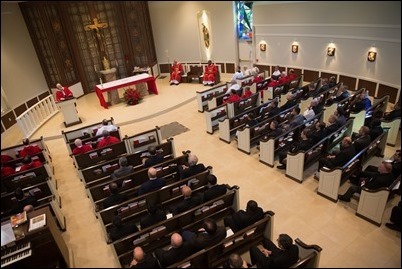 So, as I do every year, I visited our three seminaries in the archdiocese to celebrate the Mass of the Holy Spirit to begin the academic year. I am happy to report that all of our three seminaries are filled. St. John’s, where I celebrated Mass Wednesday night, has about 100 residents and about 140 students, all told. 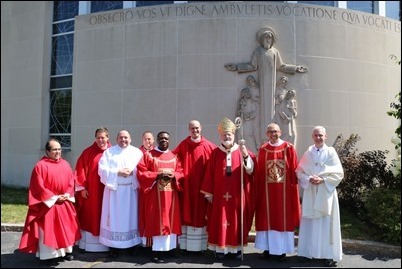 This afternoon, I celebrated the opening Mass for Pope John XXIII Seminary. And, this evening, at the Redemptoris Mater Seminary in Brookline. 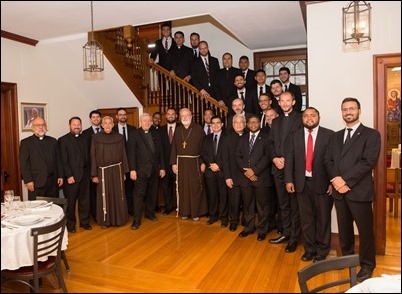 I’m very proud of them for doing this because I know that this is a part of their formation in preparation for ministry to the Spanish-speaking populations in the various dioceses from which the Pope John seminarians come. I want to congratulate them on that practice and encourage them to continue it! 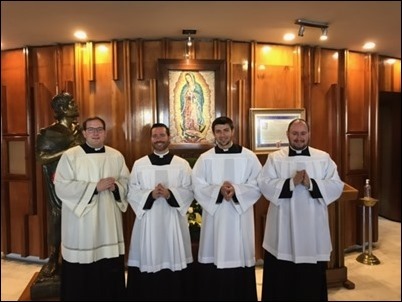 Along those same lines, this summer St. John’s Seminary sent four seminarians to the Pontifical University of Mexico City for an intensive Spanish course to enhance the Spanish language instruction that they are receiving at St. John’s. As we gather for this opening Mass of the Holy Spirit to mark the beginning of a new academic year, allow me to express my gratitude to the rector, the faculty, the trustees as well as the vocation office and to the sending bishops and superiors. I also want to say a very special word of welcome to those who are here for their first year in the seminary. We trust that the summer has been a time to be renewed and recharged so that you will be prepared to begin a new semester filled with energy and enthusiasm. Certainly, my experience of seminary life was a little different from yours. To begin with, our seminary had cows, pigs, chickens and beehives. We rose at 4:30 in the morning; prayers and many textbooks were in Latin. There were no phones, television or radio. Someone once commented that our seminary was the Catholic Amish experience without the rumspringa. There were aspects of the experience that I found quite challenging, but I am so grateful to the formation we received. However, I always do say I would’ve studied harder had I known I was going to be a Bishop. 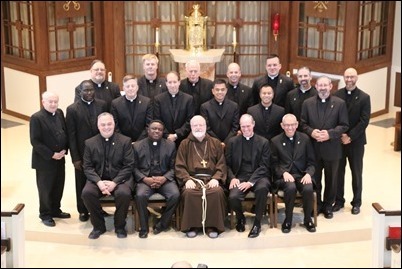 Our hope is that the seminary will help all of you grow in your friendship with the Lord and in your capacity to love and serve, and ultimately to be happy and holy priests. In today’s gospel, Jesus tells us: “Rejoice because your names are written in Heaven.” We live in a success-oriented culture where competition, profit, fame and being “number one” are very important. The latest model smart phone, stunning automobile or great clothes cannot be the source of our joy. 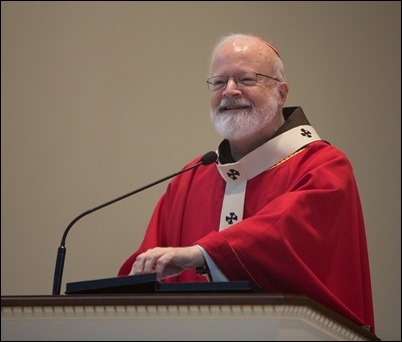 Our joy is born from the firm conviction that our God and Creator loves us, redeems us, sanctifies us, calls us to conversion, to discipleship, to ministry, not because we deserve this, but because of His gratuitous and unconditional love. True joy does not come from things, from having. No! It is born from an encounter, from relationships and friendships. In calling us, God is saying: “You are important to me. I love you. I count on you.” Joy is born from the moment in which Jesus looked at me. Our vocation is a response to a loving invitation. The Lord loves a cheerful giver. Let us respond with joy to God’s love, but discipleship and ministry are united to the Cross. St. Paul in Galatians speaks of the marks of Jesus, the wounds of the crucified Lord, as a counter sign, the distinctive mark of his life as an Apostle of the Gospel. In his ministry, Paul experienced suffering, weakness and defeat, but also joy and consolation. This is the Pascal Mystery of Jesus. It is by sharing in the death of Jesus that Paul becomes a sharer in this resurrection. If we remain in this mystery, we are sheltered both from a worldly and triumphalist view of mission and from the discouragement that can result from trials and failures. 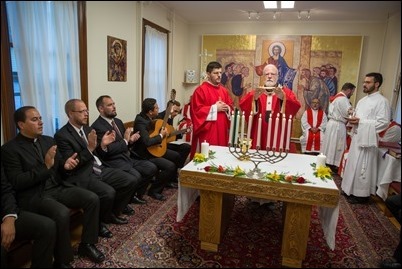 The fruitfulness of the Gospel proclamation, Pope Francis says, is measured neither by success nor by failure according to the criteria of human evaluation, but by becoming conformed to the logic of the Cross of Jesus, which is the logic of stepping outside oneself and spending oneself, the logic of love. It is the Cross that is always present with Christ — which guarantees the fruitfulness of our mission. And it is from the Cross, the supreme act of mercy and love, that we are reborn as a new creation. Today’s gospel references many of these things. Christ calls us and sends us, not because we have earned this or chosen this way of life, but because with trust we respond to His love, His invitation. In this gospel, Jesus teaches us to pray for vocations for our own and those of others. He tells us to go like lambs in the midst of wolves; danger and hardship are overcome by faith and trust. Jesus tells us to be messengers of peace in a world plagued by division, resentment, jealousy, prejudices and even hatred. He tells us to take care of the sick because the preaching of the Word of God must be accompanied by Works of Mercy. Jesus also warns us that not everyone will receive our message. He promises to protect us from scorpions, and he tells us to rejoice because our Heavenly Father knows our name and loves us. 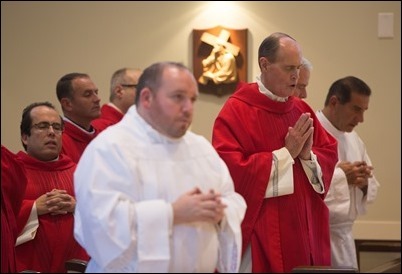 As we open a new academic year and invoke the grace of the Holy Spirit, we are mindful of the seriousness of the mission of the Seminary to prepare holy, zealous, prayerful and joyful priests. Our Holy Father often speaks eloquently in gestures. 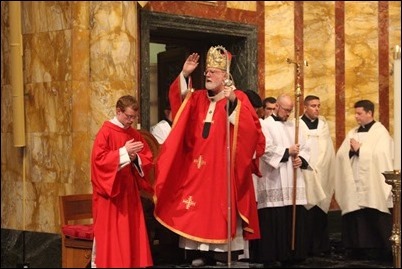 This summer, Pope Francis has named a new Rector for his own seminary, the Roman Seminary. Once again the Holy Father has gone to the periphery. 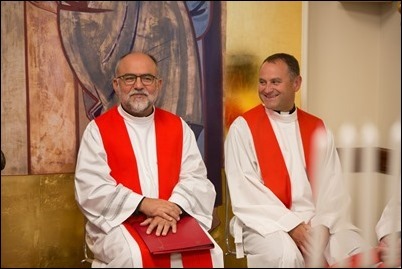 On July 31st the new Rector was named by Pope Francis, Little Brother Gabriele Faraghini, a priest of the Fraternity of the Little Brothers of Jesus of Blessed Charles de Foucauld. No one was more surprised than Little Brother Gabriele. The Brother said it was like a bolt of lightning in a clear sky. I think the Holy Father wanted to send a clear message to all seminaries as we are about to start a new academic year. Maybe Msgr. Moroney should become Little Brother James, and the Vice Rector, Little Brother Chris. Actually, the Holy Father wants us to benefit by the beautiful Spirituality of Charles de Foucauld that has contributed so much to priestly renewal. 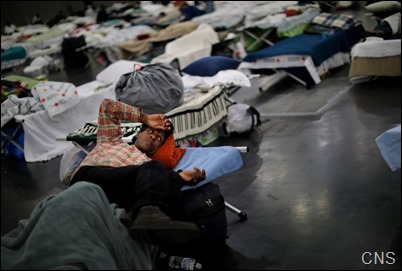 I have often reflected on the fact that the life of a priest, like Jesus’ life, has a polarity: Nazareth/Capharnaum. Nazareth being Jesus’ hidden life; Capharnaum and Peter’s house being the venue of preaching, miracles and ministry. 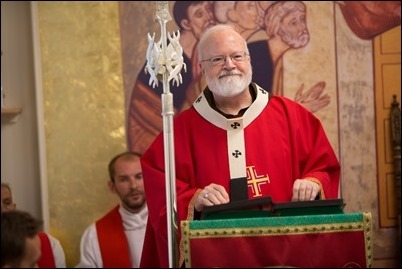 The Holy Father wants us to focus on the Nazareth aspect of seminary formation. 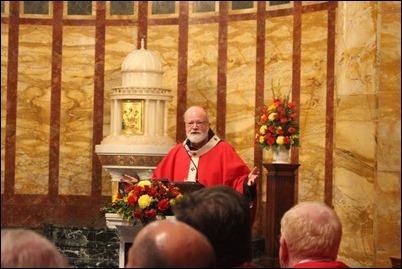 Don Gabriele said that the life of Nazareth that Blessed Charles professed was to announce the Gospel with his life, to evangelize through friendship and kindness. 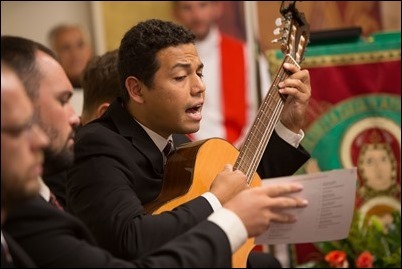 The ideals of the Jesus Caritas spirituality can truly enrich our diocesan clergy: a life of fraternity, reflection on the Word of God, love for the Eucharistic Lord, simplicity of life style and closeness to people, especially God’s little ones, the poor, the sick, the immigrants, the prisoners, the elderly, the addict. 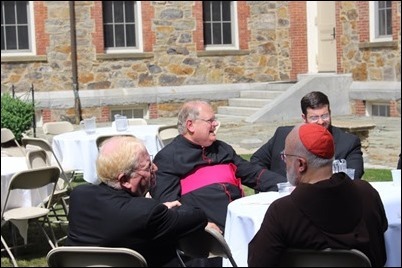 Your friendship, your brotherhood among yourselves will be a great source of spiritual strength in your ministry as priests. 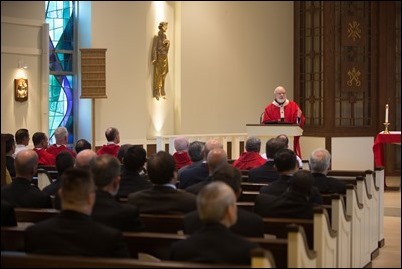 Your fraternity embraced in seminary as part of your formation will help you to persevere in your life of prayer and will make your commitment to celibacy a sure path to spiritual fatherhood. It is also an antidote to the extreme individualism and alienation that characterizes our modern culture. Learn to be brothers in the seminary so that you will be brothers and fathers in the priesthood. Unity and fraternity are not easily achieved. It takes great humility to overcome our pride and vanity that stands in the way of true fraternity. We see how a spirit of rivalry divided the Apostles as they fought over the first places at table or for thrones at the right and the left. The spirit of Nazareth is becoming little for the sake of the Kingdom. It is a spirit of hospitality, reconciliation and mercy in a world embattled in ideologies and competing for power and riches. The world does not understand Nazareth. That is why they are constantly questioning celibacy. Last week the Globe did a series of articles on the children of priests. It is tragic when a priest does not keep his vows and fathers a child. 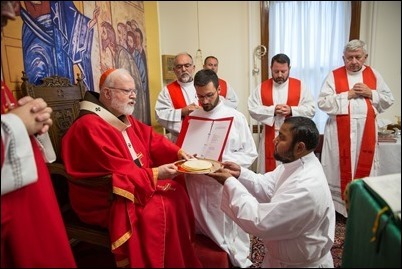 He should take responsibility and help raise that child, but these cases do not gainsay the gift that celibacy is to the Church, but to live it faithfully and joyfully we need the strength that comes from a life of prayer and priestly fraternity. Celibacy lived faithfully and generously has brought so many blessings to the Church and the world, but it must be a spiritual fatherhood lived with loving sacrifices for the sake of God’s people. It is not that priests are ordained to be bachelors, living a comfortable existence dedicated to their hobbies and the trappings of good life. 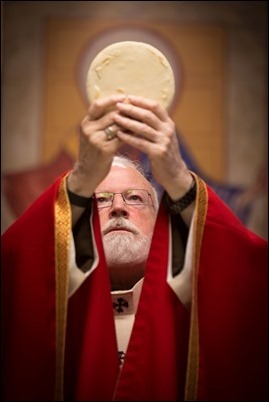 A priest is a father who lives for his spiritual family, always ready to make sacrifices for the good of God’s people. 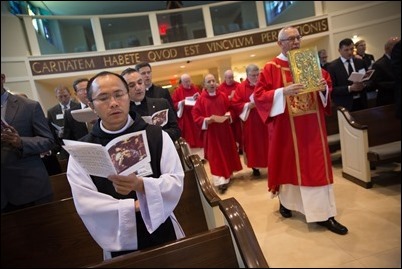 And priests who live their vocation as true Brothers and Fathers find great joy in their vocations. Those who attempt to live a double life, or are only halfhearted in their ministry soon become empty and cynical. 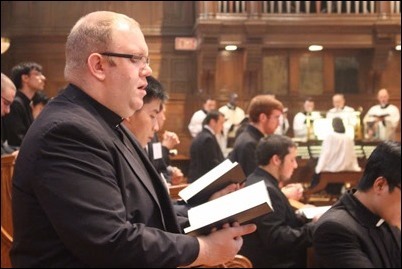 Make the best of the seminary so that you can be the best possible priests. 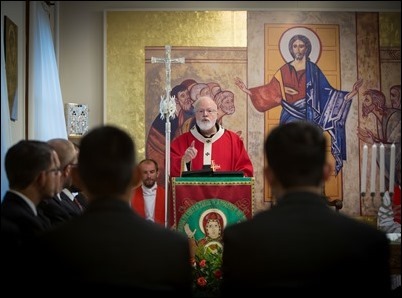 Pope Francis addressed the Byzantine Catholic seminarians in Rome recently. He told them, resist complacency, think of your studies as strength training for your hearts and wills. The seminary is the gym where you work out to give your life freely. Here you can come to treasure through prayer and intense study what the Lord has done for His people. In the gym, as well as in the spiritual life, the German adage applies: “Stillstanden ist ruckschritt.” Standing still is really going backwards. Make this a new year, a new beginning, a time to grow in your friendship with Christ and with each other. Embrace the ideals of Nazareth, and you will work miracles in Capharnaum.